Portable SSDs might not have the capacity of hard drives and might be several times the cost, but the number of companies jumping into this space shows that there is a market for them. If you're used to the performance of an SSD in your laptop or desktop PC, chances are you might be tempted to buy an external one. 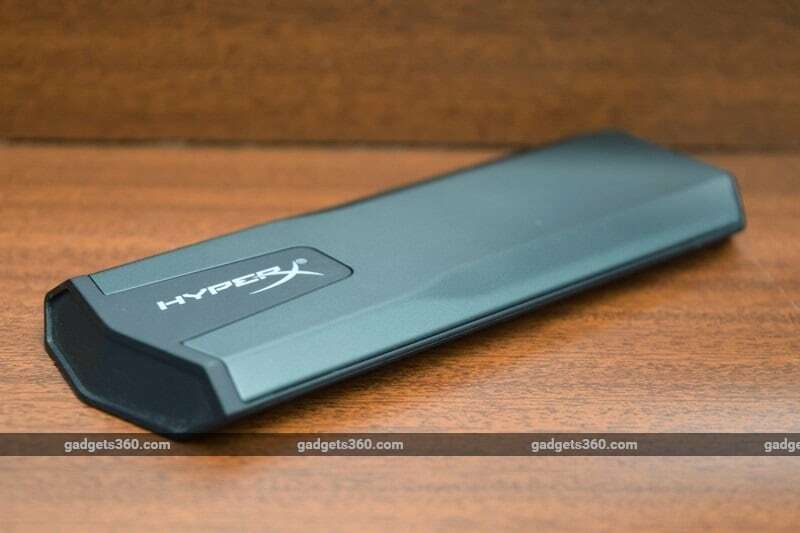 Kingston, or more specifically its HyperX gaming division, is betting that gamers in particular will appreciate the benefits of an SSD over a spinning hard drive – and it doesn't hurt that this demographic typically spends a lot of money on hardware. The HyperX Savage Exo is specifically being promoted as compatible with the Microsoft Xbox and Sony PlayStation hardware ecosystems, but that's really just a matter of marketing and positioning, since both consoles work just fine with standard internal and USB SSDs. The Savage Exo is of course also fully functional when used with any kind of PC. Let's take a closer look at what HyperX has brought to the market to find out whether it's your best choice for general-purpose use and for console gaming. Most portable SSDs these days are oblong, thanks to the standardisation of the M.2 module form factor (the stubby Samsung SSD T5 is a notable exception). Given how over-the-top some gaming products can be, HyperX has kept the design of the Savage Exo's housing rather demure. It's all black and grey plastic with a few angled surfaces and bevelled edges. 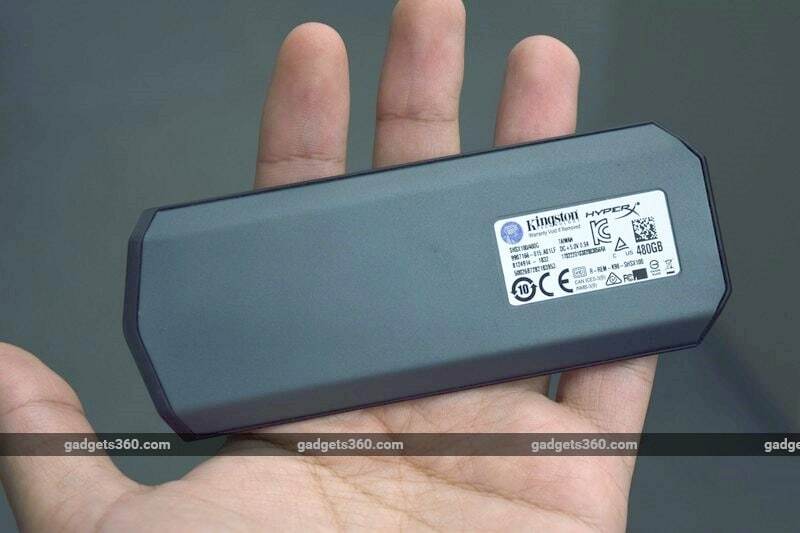 It's also surprisingly bulky – much more so than the WD My Passport SSD and even longer (but not as wide or thick) as the G-Technology G-Drive Mobile SSD R-Series. This isn't ideal if you want to carry it around in a pocket, but the 56g weight will not be noticeable at all in a backpack. The look will blend in with today's consoles so you can leave it plugged in without any major inconvenience. There's a tiny white activity LED on the rear, right next to the USB Type-C port, so even that shouldn't be too distracting. Overall, the design of the Savage Exo is much more about basic utility than conveying any sort of style or ruggedness, as we've seen from other similar products. You get two cables in the rather oversized box – Type-C to Type-C, and Type-C to Type-A. Both are about a foot long, plugs included. The only other things in the box are a warranty leaflet and a HyperX sticker. Speaking of the box, there isn't a Kingston logo to be seen anywhere except on the sticker on the drive itself which is visible through a small cutout. Despite there being a lot of overlap with Kingston in terms of product lines, HyperX is being promoted as a completely independent brand. The HyperX Savage Exo is available in 480GB and 960GB capacity options, which makes sense given that the target market is people with large game libraries. As with most external SSDs, endurance specifications in terms of drive writes per day (DWPD) or Terabytes written (TBW) have not been published. There's no support for encryption. The warranty is three years. Our 480GB review unit reported a total formatted capacity of 447.13GB. Starting with CrystalDiskMark, we measured sequential read and write speeds of 524.6MBps and 306.4MBps respectively – while the read speed slightly exceeded HyperX's own specification of 500MBps, the write speed was quite a bit below the 480MBps claim. Of course for real-world use, random read and write speeds are more relevant than sequential ones. 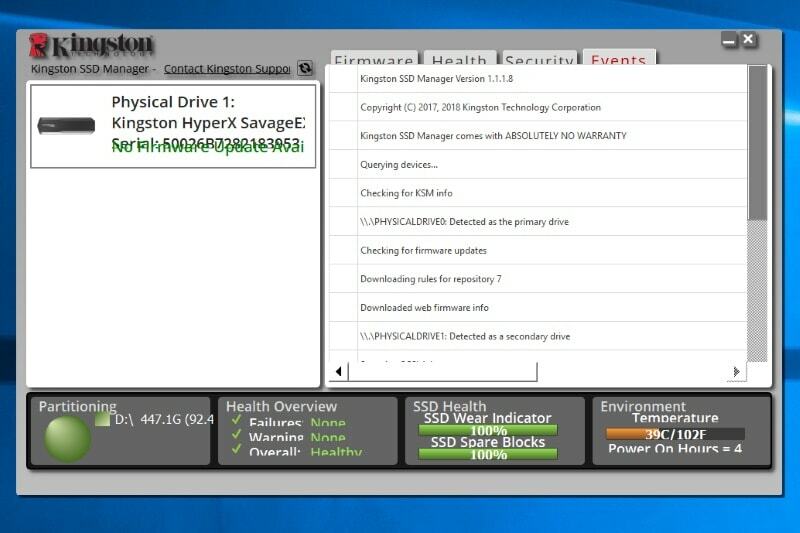 The HyperX Savage Exo managed 174MBps and 103.9MBps random reads and writes respectively in CrystalDiskMark's tests using a queue depth of 8. Kingston offers a utility called SSD Manager as a free download. If you didn't already know that, you'd be out of luck because it isn't mentioned anywhere on or in the retail package. The software is extremely poorly designed and did not even scale properly to our high-DPI 4K monitor on Windows 10. In terms of functionality, it covers all the essentials including a wear level meter, the ability to secure erase the drive and update its firmware, and detailed diagnostic reports. Seagate sells a line of hard drives and SSDs that it says it partnered with Microsoft's Xbox brand to develop, including some with Xbox Game Pass bundles, all of which have a ‘Designed for Xbox' badge and Xbox logo. There's also a model designed specifically to match the PlayStation 4. WD markets hard drives for the Xbox and PlayStation, though its website clearly notes that neither product is endorsed or authorised by Microsoft or Sony. HyperX, on the other hand, just calls the Savage Exo a portable SSD that's compatible with both game consoles and leaves it at that. As such, there is nothing that really defines it as a “gaming SSD” other than creative marketing, and it's no more or less compatible with the Xbox and PlayStation consoles than any other external SSD or hard drive. If you choose to use it this way and install games to it, you will see improved load times and a reduction in lag when it comes to things like textures popping in and your game being saved. You could also carry your library with you between consoles in different locations. Some people choose to modify their consoles with internal SSDs and that will also have a positive effect on boot times at a lower cost, but an external device is better for those who just want a simple plug-and-play solution. If you aren't after speed at all and just need more storage space, keep in mind that even a 4TB hard drive would cost way less than this 480GB SSD. That said, the HyperX Savage Exo is fast and convenient for game consoles and for everyday use, but you'd be just as happy with the Samsung SSD T5 or any of a number of other easily available USB SSDs. In fact, Samsung's option delivers higher performance scores and is somewhat more portable. It also gives you a few nice extras such as hardware encryption and much more functional companion software. The HyperX Savage Exo doesn't seem to be widely available yet and the official MRPs for the two capacity options are much too high, even by SSD standards. If street prices are lower in the future, it could be a good buy. 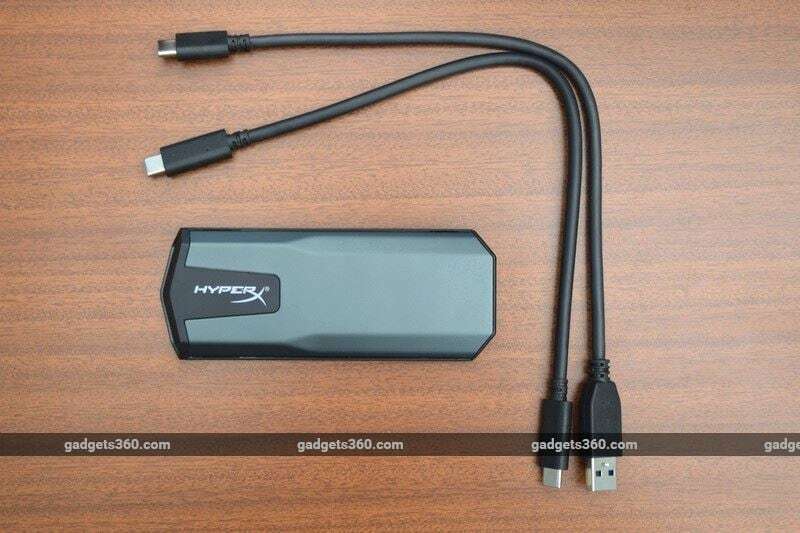 product HyperX Savage Exo is a portable USB SSD that promises to speed up your games on an Xbox or PlayStation. Is it worth it? We find out.